The tree in front of the Lake County Courthouse is the new community Christmas tree. POLSON — Last year was the final holiday season for an evergreen that has been an emblem of holiday cheer in Polson for years. The former community Christmas tree is located between Showboat Cinemas and Glacier Bank on Main Street. It will not be lit this year, and it will be removed before the next holiday season. A tree on the lawn of the Lake County Courthouse has been decorated and designated the new community holiday tree. Shauna Rubel, vice president and branch manager at Glacier Banks’s Main Street location said that lighting the Main Street tree for the holidays “has been a kind of pivot for the whole town.” According to Rubel, the Polson Volunteer Fire Department lit the tree every year for more than 16 years. The tree that will be removed is an impressive sight, standing at more than twice the height of the two-story cinema. According to Showboat Cinemas owner Gary Dupuis, the tree will be removed to make room for the theater’s expansion project in the coming year. The space where the tree is currently located will become a parking lot for the theater. Dupuis said the fire marshal told him the tree was becoming a hazard. The tree would have been removed for concerns about its size and age even if the impending construction hadn’t prompted its removal. The tree had also outgrown its function as a Christmas tree because firefighters can no longer reach the top of the tree to hang lights on it. Rubel said she made sure the removal of the tree wouldn’t mean the end of a community Christmas tree in Polson. 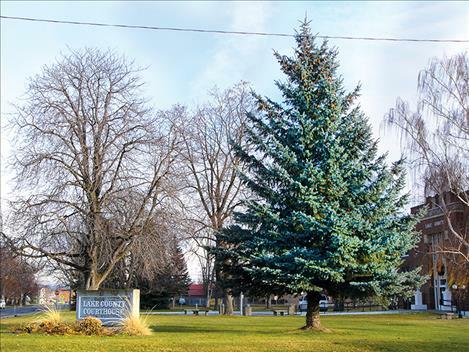 Glacier Bank worked with the Lake County commissioners to identify the new tree that will be decorated annually for the holidays. The tree on the courthouse lawn currently stands adorned with multicolored lights. “I want the community to wrap its arms around the concept of a new tree,” Rubel said.